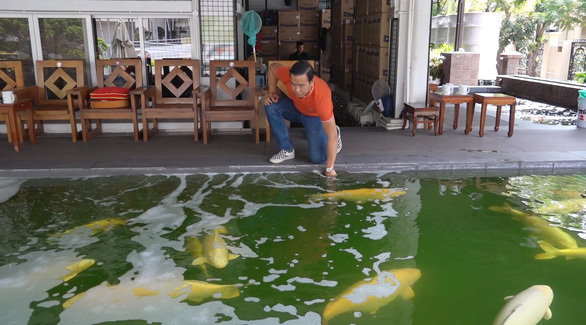 Raising Koi fish directly imported from Japan has become the latest trend for Ho Chi Minh City’s wealthy elite. To many, Koi fish are simply colored carp from Japan weighing 20-25kg, but to those in-the-know, Koi fish are a symbol of fortune and courage prized by wealthy hobbyists who determine each fish’s value based on its color, pattern, and brightness. 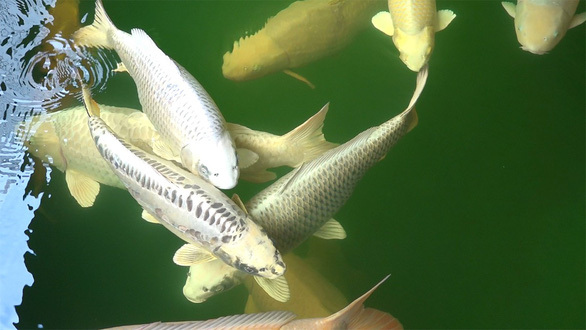 Koi, known as nishikigoi literally "brocaded carp" in Japanese, are colored varieties of Amur carp that are kept for decorative purposes in outdoor koi ponds or water gardens. Koi varieties are distinguished by coloration, patterning, and scalation. Some of the major colors are white, black, red, orange, yellow, blue, and cream. in Vietnam, the most highly prized Koi start at prices of VND500 million (US$21,527) and can range well into the billions of dong. 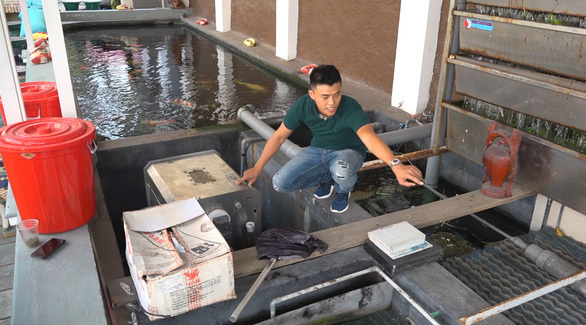 Since 2010, when raising Koi began growing in popularity amongst wealthy Vietnamese, several competitions and groups have been established in Ho Chi Minh City to support enthusiasts. Among them are Koi247, the Vietnam Koi fish Association, and most recently the first-ever Vietnam Open Koi Show 2019 held in mid-March. One local woman, known in the local Koi scene as the “Vietnamese Koi Queen”, has earned particular fame for her dedication, and deep pockets, when it comes to importing Koi valued at billions of dong (VND1 billion = $43,100). The ‘queen,’ who requested to be known only as Huyen, said her passion for the Japanese fish was inspired by her husband, an avid Koi enthusiast. “Five years ago, my husband sold a VND6.8 billion [US$292,770] plot of land, just to buy a Koi fish in an auction,” Huyen recalled of her first introduction to the Koi business, or ‘Koibiz’. Huyen was so shocked by her husband’s decision to buy the fish that she immediately went with him to see his new purchase. It was during that first experience seeing a Koi that she became immediately enthralled by her husband’s love for the fish. “The way he embraced [the Koi fish] in his arms, how he prepared the pond, and stayed up all night just to observe the creature in its new home captivated me,” Huyen said, adding that her love for Koi stems from the bond she shares with her beloved husband. Thanks to her reputation, Huyen has been invited to judge several Koi competitions, including the “All Koi Show Japan”. Not all Koi admirers were immediately smitten by the fish. For some, like Liem Le in Thu Duc District, Ho Chi Minh City, a love for the fish was slow coincidence. 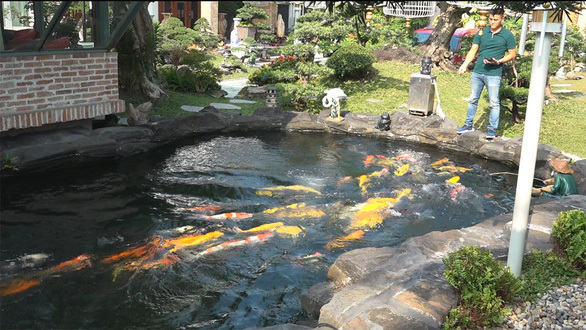 “Three years ago, my family moved to a house with two customized Koi ponds,” Le said. As time went on, Le developed a love for the fish and has become a well known member of the local scene. But even he admits the price of raising Koi is steep. Currently, his monthly Koi bill ranges from VND15-20 million (US$646-861). “I never encourage others to pursue this hobby because the maintenance cost is exorbitant,” he shared. According to Viet, another Koi fish admirer in Binh Thanh District, the Koi’s pathway to fame in Vietnam began five to six years ago. At the time, only the wealthy opted to rear these delicate pets, and the trend wasn’t not so well-received. Now that the market is booming, Koi of various qualities and origins are available to cater to its growing demand. According to Viet, to date, Vietnamese-bred Koi fish are beginning to make a name for themselves at international competitions. The sense of competitiveness, coupled with the expanding market, has given rise to many specialized Koi farms. Ngo Thang, the owner of one such farm, has as many as 50 Koi in one of ponds. Many agree that the path to rearing Koi fish en masse has both opportunity and challenge. Besides the arduous import route, every single Koi fish must be thoroughly examined to receive the green light for sale. That is not to mention the species is pretty fragile, and one single change in the environment is all it needs to kill the creature. Once, some of Viet’s relatives was none the wiser when they threw in some alien fish to his Koi pond. The act sullied the water’s clarity, which resulted in the death of two-thirds of his Koi fish, which were worth several hundred million dong each. For Le, a VND200 million ($8610) Koi in his pond, due to neglected healthcare, met its doom just days after purchase. The cause was later discovered to be a festered tuberculosis. Now that Koi fish breeding is no longer a rare occurrence in Vietnam, shady businesses have taken root. In the name of profit, many dubious farms even turn to Chinese Koi breeding, instead of the Japanese counterparts, which in the long run risks compromising the species’ genetic makeup, thus ruining the market. To avoid the consequences, Viet advises new Koi fish practitioners to read up on the animal in reliable sources before making any big purchases..